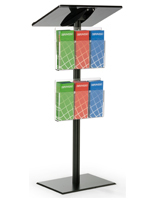 These black podiums with snap frame are great for restaurants, schools and convention centers with their simple, yet useful design. 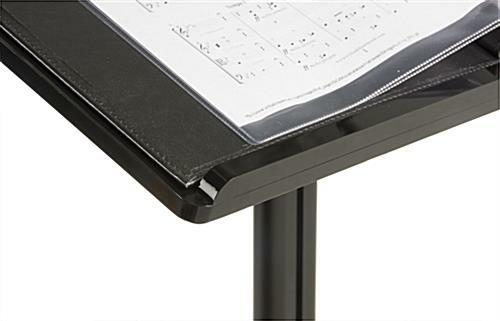 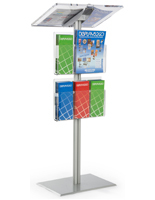 Each stand features a front mounted graphic holder for displaying 22" x 28" posters in a portrait orientation. 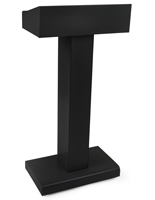 The black podiums feature a clear, protective lens that keeps prints from being damaged by moisture and fingerprints. 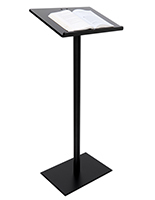 The lecterns with a portrait graphic holder feature a 18.5" x 13" reading surface with a 1" book stop that prevents materials from slipping off. 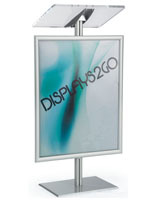 The podiums for convention centers are sent flat to save on shipping costs, but are easy to assemble. 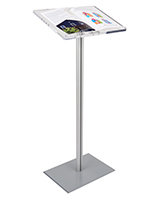 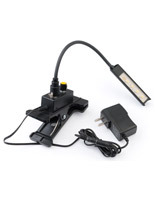 This type of display lectern with a clear lens is also available in a silver finish.